or to empathize with them and learn how it feels to “be” one of them. While the latter is certainly a rich experience that I would recommend everyone to try out some time, it absolutely must not be required to accomplish one’s tasks. That is what good user interfaces are made for, and the division of labor between operator controls vs. the stuff ‘under the engine hood’. (If you think the reality of my own tool contradicts this aspiration you might be right but please do tell me when you find a flaw.) And it is not only ethically questionable to urge people into alien thinking, it is also tactically silly, because once the typical aversion and blockage is in place, the ‘getting into’ becomes just more impossible. So when the graph theory nerds insist on their swollen terminology such as “vertices” and “edges” for their simple items and lines even when talking to other disciplines, this is IMHO a very unnecessary scaring and excluding, and it is not the only way to the future. On one hand I understand very well the future role of plumbing and fiddling and tinkering — e.g. changing parameters in Jupyter notebooks and trying again. But OTOH, this ‘plumbing’ should not literally mean that I have to repair the red or blue taps for hot and cold water, but rather, to use the water for cooking and then ‘change the parameters’ to experiment with new meals. 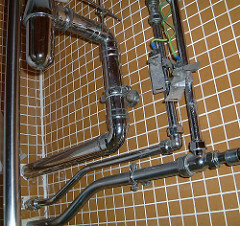 Yes, plumbing where no algorithms exist yet, this will probably be the job left over for humans. To co-exist with the algorithms, then, it is necessary to be able to talk to them and to their developers. Talk across the divide, not trying to blur the division of labor. Most prominently this means, to understand why, and get used to that, IT staff and devices are sometimes so annoyingly stubborn; for example, when end users talk about their colorful fuzzy subject matter, we insist in asking back until we can model their stuff into our rows and columns. A simple example how the co-existence between human and machine could have worked, but failed, is just this unfortunate RSS from last week: It is written in XML which is intended for the machine and should work behind the scenes while users are reading their HTML pages. But by trying to blur this clear division (e.g. by applying fancy style sheets), gradually a total mess and confusion emerged, which, of course, helped the platforms to suffocate this dangerous democratic decentralizing technology, such that even a politically aware historian finally gave up. 2 Responses to #EL30 Week 3: Plumbing? As someone who is not an IT Professional and has little desire to ‘get under the hood’ I find your post resonates on many levels. Of course ‘under the hood’ is essential for technological advances, but there needs, from the user point of view, to be a clear understanding of the ‘why’ we need these advances and even more importantly, can the advances benefit me, without me needing to get under the hood. As you say, a lot of the problem lies in the language used. A headteacher I once worked for told me that unless I knew how to teach Reception children ( 4 and 5 year olds), I would never be a good teacher. I have been forever grateful that he insisted that I spend a couple of years teaching this age group, because it made me see how important it is to be able to explain complex concepts in simple terms. Maria Montessori was a good example of this. She taught algebra to young children using the binomial cube. Graph theory is going to be way over my head, but I thought the first recommended reading – https://medium.com/basecs/a-gentle-introduction-to-graph-theory-77969829ead8 – was indeed a gentle introduction and in the spirit of Maria Montessori, but whilst it is useful to be aware of this, will I ever need to apply this? I need to know just enough to be aware of where everything is headed, so that I can reflect on my educational philosophy, but I’m not sure that means I need to go ‘under the hood’. Thank you Jenny for the positive response, and for the added perspective. If she lived today, Montessori might have become a great usability engineer.